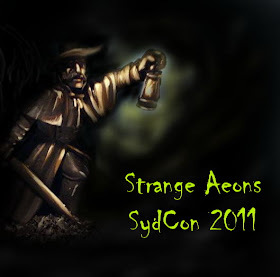 Just wanted to say that I've decided that the demo I will be running during this year's SydCon (miniature wargaming convention in Malmö, Sweden) will be of Strange Aeons. I have to prepare a few things (text & scenario) and don't think Empire of the Dead will be released in time to allow me to make a proper demo of the rules. So if you are in or around Malmö during the last weekend this October, check out SydCon and drop by the demo table to say hi or give Strange Aeons a try. SydCon will start on the 28th in the afternoon but I will be there during Saturday/Sunday. Not 100% sure I will make it both days, but Saturday at least is certain. I have this idea of a 4x4 demo table so it should be visible from a distance. I will probably bring along my "Lovecraft" collection of miniatures as well and keep them on display. Pär from Kulturkommissariatet should be there with a field store selling a bunch of games and models, Strange Aeons included.